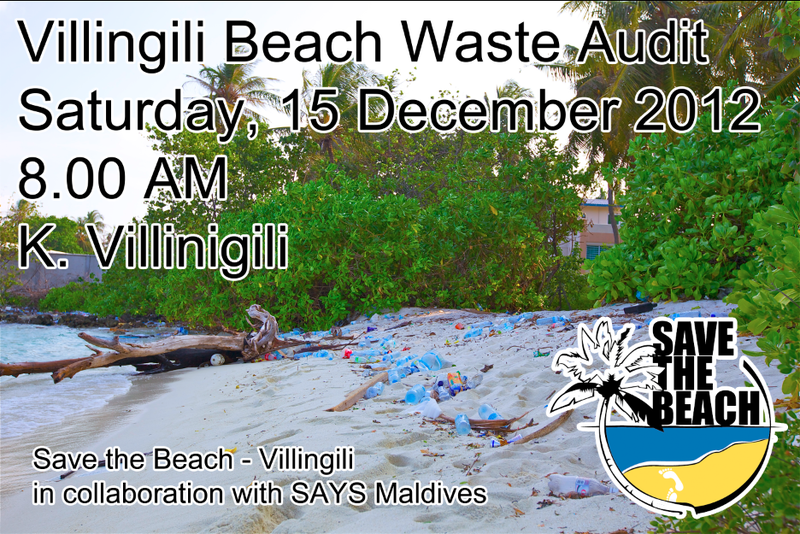 A waste audit will be done on Saturday 15 December 2012 for the beach to determine what gets dumped on the beach. The data collected will be insightful and will help us determine the recycling and waste management requirements for the beach. According to the Environment Protection Agency (EPA) a litter audit has not been done on a beach here in the Maldives. The facts will be interesting for all concerned. The data will serve as a baseline for future audits, comparisons and an all round better waste management systems for the beaches. Save the Beach will host a training seminar on 13 December 2012, Thursday at 4.00 pm. After the training, decisions will be taken on identifying groups for the four audits that Save the Beach has decided to do. These four audits will be done for four separate areas of the beach to get a representative sample. The waste audit will take place on 15 December 2012, Saturday at 8.00 am. There will also be a barbecue for volunteers afterwards.